Can Batteries Solve The Intermittency Problem? 1) Storage systems are eligible for subsidy under the Capacity Market and also the National Grid’s Supplemental Balancing Reserve, both designed to buy in standby capacity. 2) Power produced during times of surplus, say on windy or sunny days, would tend to have a lower economic value. By using it to recharge batteries, the stored power could be sold at a higher price at times of shortage or high demand. Hywind Scotland, the floating offshore wind farm is a good example of the latter, with plans to add 1 MW of storage. We often hear about the capacity of battery systems, but rarely how long they can supply this power. In other words, the amount of energy stored. Hywind tell us that their 1 MW will supply 1.3 MWh, meaning it can only run at full power for just over an hour. Elon Musk’s heavily hyped Tesla system in South Australia has a similar ration, 100 MW and 129 MWh. These sort of systems may be OK for balancing small, short term spikes in the grid, but are totally useless for dealing with the problem of intermittency. So, just how much storage would we need for that? I have analysed the official wind power in the UK for February 2018. As you can see, it is highly variable, ranging from 369 MW to 10313 MW. The theoretical installed capacity is 18100 MW, and the average in the month was 5300 MW. If there was no other form of backup power, and we had to rely solely on batteries, how much storage would we need to continually supply that average of 5300 MW? 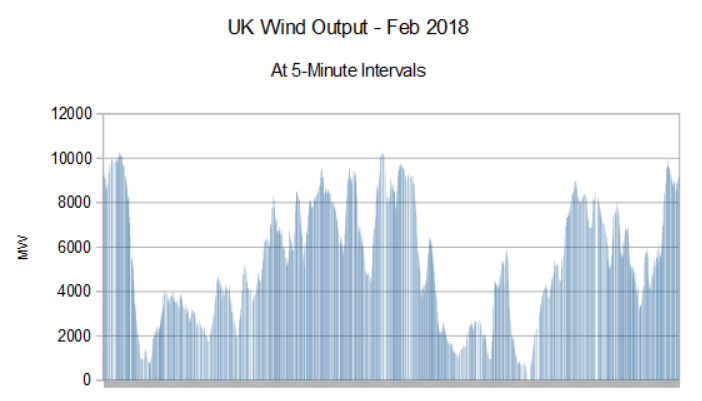 There were two periods during February, when wind output was seriously reduced for lengthy spells. During the second spell, output was below average from 16th to 23rd February, averaging 2870 MW, just over half the average. To supply this shortfall, a battery storage system would need to have stored 405 GWh, which is equivalent to about three days of average output. To put this figure into perspective, Musk’s Australian battery stores 129 MWh, so we would need 3140 of them. At an estimated £125 million each, we would be looking at a cost of £392 bn, and they would all likely need replacing every ten years. And all this just to back up wind farms that only supplies about 15% of the UK’s electricity. I have only looked at one month, and it may well be that even more storage would be needed at other times of year. 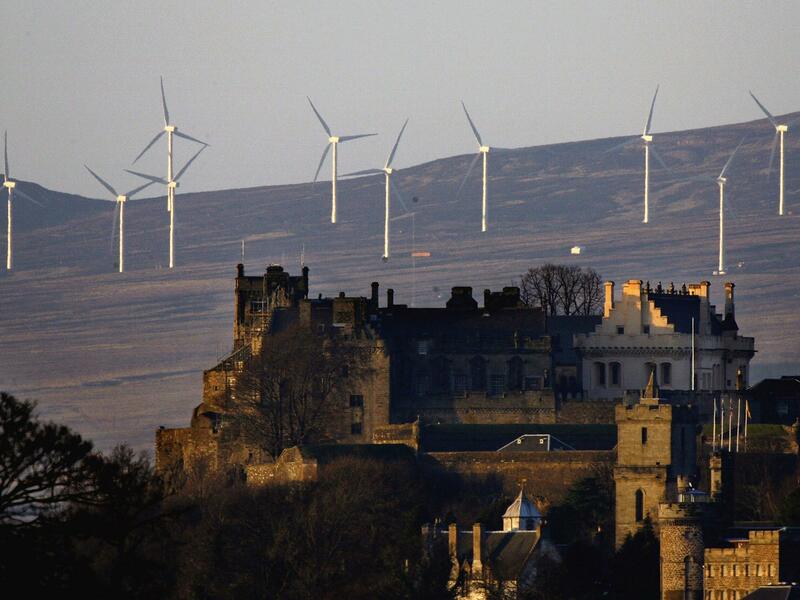 To put the figures into perspective, Hywind Scotland, used as an example above, has installed wind turbine capacity of 30 MW, probably giving an average of about 12 MW. Instead of the 1.3 MWh battery it is installing, Hywind would need 665 of them, to be able to ensure continuous average output. If all wind farms were legally obliged to install three days of storage, there would not be many left! This exercise shows above all why the dream of running the country on 100% renewable energy is just that, an impossible dream.